Rocko‘s latest work is not another castle diorama, but a minimalist horror scene inspired by Dune. The simplicity of this piece of work tells a lot about the stark horror of the subject. Nicely done Rocko, I dig it. Ramone- The Spice must flow! AWESOME!! :-) One of the coolest things I have ever seen built with Legos. Very nice work! We need some more close ups of wormy’s dental work. I’d like to see what some of the unworthy, slower Fremen look like. Horror is the wrong word. 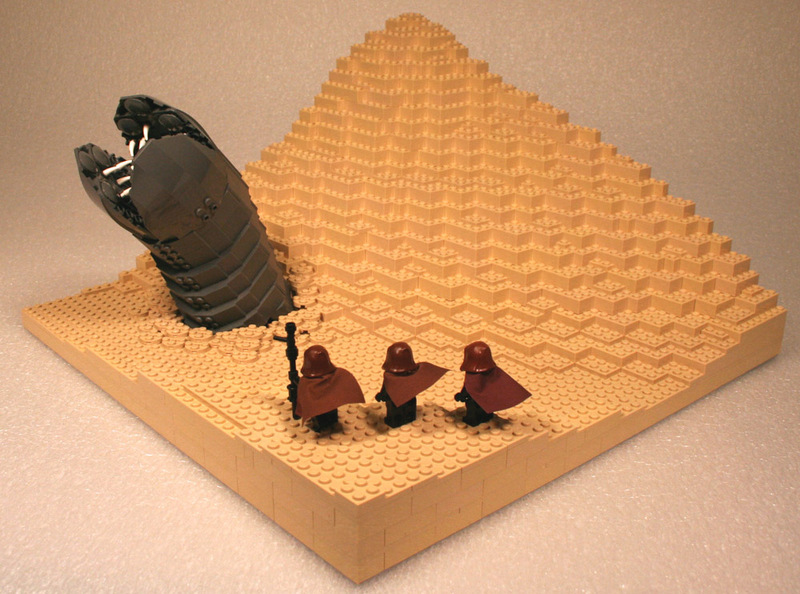 Epic yes, but sand worms to the desert people are revered. So one could claim that its a religious piece. Silly Fremen, must have walked WITH rhythm. Well, it’s a small maker, but that’s the most fantastic thing Ive ever seen. Ditto on this being a religious piece and not a horror piece. Remember Paul Maud-dib’s coming of age? He had to catch and ride the maker on his own. Gojo, calling a worm is something they do on purpose…you know, to ride it. Very nice, though. Wormsign that not even God has seen. it’s “U’sul we have wormsign the likes of which God has never seen which was never anywhere to be found in the book. Also, if you’ve never read the book, then the 80’s movie was “OK” but left out ALOT and I mean ALOT MORE THAN AVERAGE. The Sci Fi channels mini series version is much closer to the books. I have heard they are currently scripting a new big screen version. Hopefully, this one will better detail Muadib’s terrible purpose and the completely omitted major part of the book…THE FREAKIN TREES!! !